I found these hikes while cruising the WTA (Washington Trail Association) site trip reports. I found some week old reports that had great reviews of the fall colors so I thought I should give them a try before they got all snowed in. I was a bit late for the fall colors, but I was well rewarded for my timing. I got to the trail head a bit later then I had wanted. I forgot to check this hike for required passes and so had to make a stopover at the Snoqualmie ranger station to pick up the proper passes, not a big deal, it only set me back about 30 minutes. Even with the delay I was on the trail around 8 AM with only 2 other cars in the parking lot. The air was chilly so I was glad I had brought some layers for the cold weather, but I was definitely not expecting temperatures around freezing starting out with some small accumulation of snow on the ground. 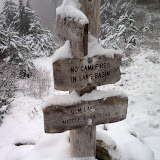 I decided t hike until I was in snow over my ankles or until it started snowing. I was not equiped to spend a night snowbound, so I wanted to be on the safe side. The hike starts out on a fairly flat trail working its way through some rock slide areas in and out of forests. At around 1.7 miles the trail cuts sharply and starts to climb immediately up to the ridge. At the top of the ridge you enter the Alpine Lakes wilderness (YAY!) and you get this great view of snow lake through the trees. The snow on the lake made it even more gorgeous, it was an amazing site. The trial drops down to the lake and you walk along the lake edge for a while before circling behind a ridge to the next trail junction. You mix back up with the shores of Snow Lake off and on then start to climb away from the lake towards Gem. I was really surprised by the performance of the shoes. This was just my 2nd hike with the trail runners and they did great. I kind of expected my feet to be soaked and freezing when I got back to my car, but my feet never got cold and I'm not sure the slight dampness I had was not from my feet sweating as much as it was from the snow. I definitely had snow on and around my shoes and despite being not water proof, water and my feet were never really a problem. All in all I'm really glad I did this hike, there was really a perfect amount of snow to make the hike enjoyable the whole way and not too treacherous without special gear. The scenery was fantastic and the hiking was fairly good. I should start recording elevations for my hikes. I wonder if I should get a GPS that could do it automatically for me? Hmm.